The founder of Salaam Peace believes the general public is finally starting to wake up to the role that sport can play in building a better society. Sabir Bham was speaking after his organisation was named winner of the ‘Sport Unites’ category at the London Sport Awards at Twickenham. The category was created in partnership with the Mayor of London, and celebrates organisations that use sport and physical activity programmes to improve community cohesion and social integration in the city. 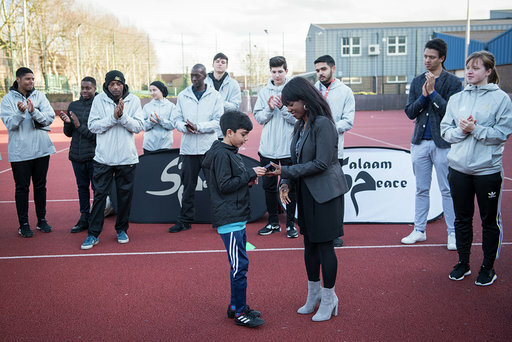 Salaam Peace was founded in the wake of the 7/7 bombings, and uses sport and other interventions to bring diverse communities together in East London. 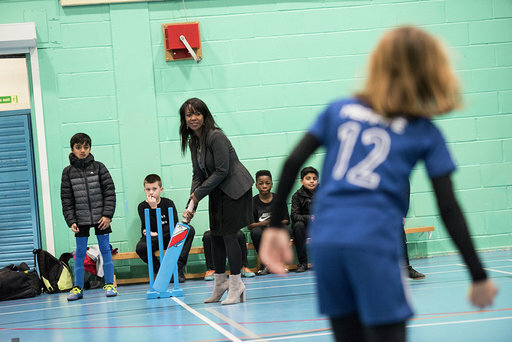 Deputy Mayor of London Debbie Weekes-Bernard (pictured) recently visited the project. Sab told ConnectSport: “For me personally and for the organisation, this award is great recognition for our continued work. From our very beginning, the aim was to bring people together. “For us to be having such an impact and bringing various groups together – not just participants but also our staff-volunteer team is very diverse – this cements what we do. All of our partners and funders are aware of our success as well, and they are over the moon. Salaam Peace was shortlisted for the award alongside St Matthew’s Project and UK Wallball, while other winners with a strong social impact included the Panathlon Challenge in the Children and Young People category, and the Single Homeless Project’s Sport and Health Programme in the ‘Physical Activity for Health’ Award. Disability Sports Coach won the Workforce Award and Saracens Sport Foundation were awarded the ‘Harnessing the Power of Elite Sport’ prize. Sab believes that with social problems like knife crime, radicalisation and youth violence on the rise it is vital that community-based organisations continue to provide effective interventions, whether that’s through sport and physical activity, or otherwise. “Generally there is more of an awareness now when I speak to parents and carers of young people, especially those who are perceived to be ‘hard to reach’,” he said. “It’s not just sport, I would include music and art in this, but when young people don’t haven’t got a passion, or something that keeps them engaged positively, then they are more likely to go down a negative pathway. “A few years ago we had an Eid Cup; I remember it was on the same day that the BNP were marching through Waltham Forest. I also remember an Imam who supports our work was addressing the audience – about 400 people with around 175 who were Muslim – and he said that ‘If you don’t find something to do, someone will give you something to do’. “He meant that if you are not doing something productive then someone – whether it’s a drug dealer, gang leader or whoever – they will pick up that you are there for the taking and they will get you on board by polluting your mind with their viewpoint. That always stuck with me. “When I was young, a lot of my friends – especially those that I played football with aged between 14 and 17 – fell away from participating, they went down the wrong pathway and ended up in prison, on drugs or doing goodness knows what. I didn’t want that so when they were doing stuff like that on a Friday night, I would go down the gym. That kept me from following their example. “I think awareness of that process is growing, and you hear a lot about it now. There have been so many funding cutbacks over recent years, especially around youth services, that now people are saying ‘we need more community centres’. “If more centres did open, would knife crime still be what it is? We can’t be sure…. but I do know that some people in government are realising what needs to happen.